How’s the weather, everyone? Summer made its debut in my neighborhood over the weekend, which means one thing: GRILLING. And lots of it. 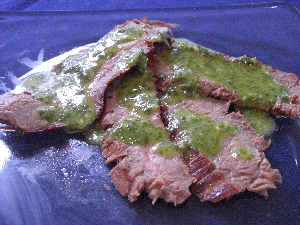 And one of the very best condiments for a nicely grilled piece of meat is definitely chimichurri. Originating in Argentina, chimichurri is a vibrantly hued sauce that is packed full of flavor, and as a bonus in the warm weather, it doesn’t require an iota of heat to make! In a food processor, chop the garlic. Add the red pepper, parsley and cilantro and process until the herbs are finely chopped. Add the cumin, salt, olive oil and vinegar. Pulse until the mixture has emulsified and the sauce is bright green. Serve immediately on whatever you just took off the grill.